India's most successful cricket coach John Wright feels that Virender Sehwag's return to the side as an opener could ease the mounting pressure on Rahul Dravid. Wright, former New Zealand captain, who was in charge of the India team on their successful tour down under four years ago, was not willing to add to Dravid's pressure by publicly analysing his much-scrutinised performance in the first Test, where his combined tally was 21 runs from 180 balls. As Dravid fought his way past cameras and reporters to climb on the team bus at Sydney Airport Monday, his former mentor, Wright, reinforced the value of a positive frame of mind in Australia and said the former India captain could be liberated if Sehwag was brought back to the top of the order. "The Indian team is best when it is playing its shots. Sehwag certainly gave us a lot of momentum on the last tour and I don't know what form he is in but I just feel you have to be positive against Australia and put the bad ball away," said Wright, the New Zealander who four years ago came close to orchestrating Australia's first home defeat since 1992-93. "He succeeded in Australia last time so he has got that behind him. I just felt, looking from here, that the lead-in has been insufficient, so Melbourne for any Indian batsman was going to be a very, very severe examination. The team needs him." Dravid dominated the Australian attack four years ago, with more than 600 runs including a double hundred in Adelaide. This time, Sehwag was a last-moment inclusion in this touring party from outside the shortlist but was not picked for the Boxing Day Test, where he last time pounded Australia's bowlers for 195 without appearing to move his feet once. Dravid and opening partner Wasim Jaffer could not have provided a bigger contrast in Melbourne, where they were suffocated. If Sehwag is recalled, Yuvraj Singh would almost certainly be dropped from the middle order after the languid display that so displeased team management in Melbourne. "Australia bowled very well but you can't allow them to bowl at you," Wright said. "I'm probably biased, but he (Sehwag) gave us so much at the top of the order. He's the sort of player that needs to be backed and be given a lot of confidence to go out there - as long as he plays straight - and back himself. I would love to see him back in good form. Then Dravid can slot in at three and things follow from there." Dravid has endured a tough year since resigning as Indian captain, a job that carries the expectations of a billion people, after the historic away series victory over England. Those close to him say he is feeling more positive after his improved performance in the second innings. 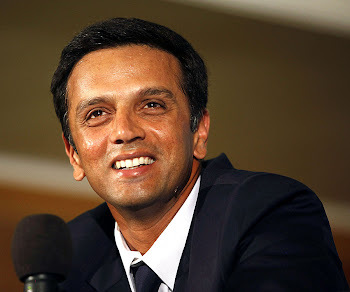 Former India captain Ravi Shastri has urged Dravid, who has more than 9,000 Test runs to his name, to "chill out". Shastri said Dravid should not beat himself up about his performance in Melbourne. "He is an ambitious character and a terrific player for India so he sets standards for himself," Shastri said. "Sometimes you just have to relax."